Works that transform the value placed on what society has thrown away. James Alec Hardy has not always worked only with video; he has experimented with other mediums before, but what really drew his interest at the end was that “the canvas screen is instantly defined and active.” From the history and development of television to the way in which the human brain can perceive a moving image, the artist walked me through his vast collection of analogue equipment, most of it considered to be of ‘low value’ to the uses of contemporary society. The old machines that the artist uses are more flexible and capable to be misused, completely transforming their value. And through this manipulation, the artist makes us pay attention to the dangers of new technology. As I sat down in his studio, hypnotised by the harmonic video sequences, which are manoeuvred by the complex feedback systems that he has created, James talked me though his influences and references, his music background and how important rhythm is for his work. James Alec Hardy (b. 1979, Colchester, UK) graduated from Camberwell College of Art, London. He has previously exhibited at Kristin Hjellegjerde, London; ArtMoorHouse, London; Karst Contemporary, Plymouth; FOLD Gallery, London; The Hospital Club, London; Vanity Projects, New York; Mdina Biennale, Malta, amongst others. James currently lives and works in London and is Represented by Kristin Hjellegjerde London and Berlin. You mentioned that you have experimented with other mediums before – what drew your interest to video at the end? There are so many variables and dimensions, such that the parameters are dramatically shifting with the smallest of adjustments. It makes it a highly responsive medium that reacts to alterations in real time to the trace of my hand. This sensitivity allows for vast range of physical gestures that are expressed within the recording of the video. Video is the most immediate and engaging medium, as the canvas screen is instantly defined and active. 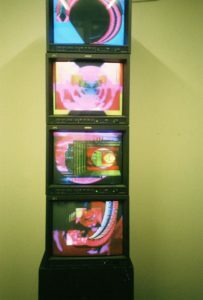 The video feedback is “live” as soon as the power is on and the machines connected together. I create complex feedback systems which may be considered chaotic, constantly pouring out forms which I can wrestle with, in an attempt to resolve into more ordered compositions, to be edited into meaningful sequences. The earlier video works I made at college, were always audio pieces nestled within videos. I used sound as a controlling medium, which is similar in its forward driving momentum to live manipulated video. When audio is attached to a visual video platform, the subconscious level of hearing is reinforced when the viewer is locked in a visual spectacle. It seemed to me to be a powerful and successful way to harness the attention and engagement of the viewer. The history of television and moving image has shaped and defined our contemporary culture, existing as a medium that we both trust and rely upon for information and entertainment. The development of technology concerned with video has always been about trying to create an illusion, which is as close to a real life experience. It has been about creating a bond between viewer and screen, and affecting the environment in which it is displayed, drawing attention to the moving action. 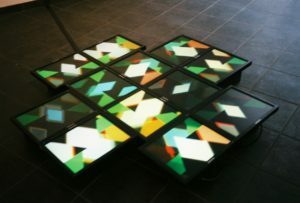 The early video artist pioneers were very optimistic about the possibilities for global communication and saw the medium as capable of positive transformation. In a post truth era, we are able to be more discerning and doubtful, and we are empowered to question far more than what we are shown. As a tool for propaganda, is has been near perfect, being able to create and sway public opinion and thought. It was mostly an untouchable medium for many for years as the cost of equipment was very expensive, and a high technical expertise was needed to operate. Since the invention of camcorders and home editing in the 1990’s, leading up to digital video and more accessible capabilities to edit on a home computer, it has become a much more prominent medium which is still within its formative years. Apart from an artist, you are a musician as well, and there is a certain rhythm to your works. How does your music background affect your current artistic practice? I hold ultimate respect for true musicians, those classically trained and gifted with harmonious souls, so I would categorize myself within the ‘Musique Concrète’ group when describing my practice, because the technological process is dominant over the creation of the compositions. A core subject of interest to me has been the enchanting and bewitching power that can be produced by music, through rhythm and harmony. Plato suggested licensing for musicians circa 500BC, as he saw the power music held over youth, to the affect that you could drive people to battle with a beating drum, or that one can dance oneself into a trance. I have explored Shamanic approaches to the ritual in performances over the last 17 years, and through this, I have trained how to engage with people directly and conjure spectacles. I have enacted out unique and varied sound performances that always had a strong visual and structural video element contained. 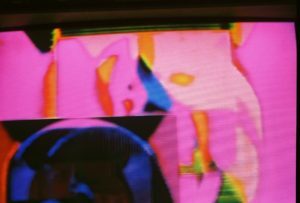 I found more unusual and challenging ways to introduce video screens, to ultimately produce performances that created the sound purely from the video elements. In the studio, I am creating the video sequences in real time, and use the sound elements to shape and modify the video. When I get to construct the sculptural works for exhibition, I see them as being monuments that contain the recordings from earlier performances. Each work is typically a numerical title that relates to a date of creation of the performed “live” video. You seem skeptical of the role which new technology plays in our lives nowadays, why is that so? I’m old enough to remember a time before the Internet, and before smartphones, and before social media and networking. I am trying not to forget that actually things worked just fine before, and that the new technology is not an essential asset to being able to have a reasonable to high standard of living and expectations in contemporary existence. I have observed in myself, and others that the technology is making physiological and psychological changes which is not necessarily so advantageous or beneficial in the long-term. Creating a relationship with technology, which can become addictive because we seek stimulation and also acknowledgement and appraisal, can only modify our behavior, and lead to a superficial embrace of reality. I have heard sources directly from employees of Facebook explaining the psychological training with technology, and the effect of dopamine being released, and leading through to an addiction. If the hyper realizations of our virtual selves start beginning to succeed our actual, then anxiety issues can be attributed to this. I would recommend listening to Johnathan Haidt discussing “Facebook as a social catastrophe”. The digital footprint we make allows the possibilities to be monitored and tracked constantly, by marketing companies and also by authorities, which dismantles the notion of being private anymore. I did jury service some years ago, and the police can easily request all phone data, and social media data, which gets given on a plate. The Big Data and Tech companies that “invisibly” sway, manipulate, and market the police our online experiences, are tailored individually to us, so we get reduced to being nodes. The most severe fear of the role technology is developing into, and capable of functioning, is straight towards totalitarianism, step by step by step. Collecting and repurposing analogue equipment is a significant part of your work process. Why are you so interested in old technology? When is its “expiration date”? It began with the excitement I had in discovering and hunting down old equipment, and finding that there is a tremendous amount of antiquated analogue devices available. With not much money, I started being able to buy very cheap machines, and started a collection, with each new addition bringing a whole new dimension and range of possibilities. So this lead to collecting over 200 items, and amassing 100’s of CRT and VGA screens to use in my work. I have always emphasized obtaining equipment as cheap as possible, therefore assimilating that the machine is of a low value to the source. My role as an artist then begins to transform the value placed, on what society has thrown away, into representing new contemporary ideas, placed within older frameworks. The older machines perform well to their original function, and are also more capable to be misused, and repurposed as a greater degree of flexibility and accessibility to the components in earlier design. 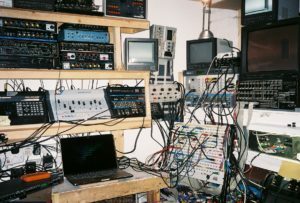 Equipment from 1970’s-1990’s was also built to last, and a large majority of machines are from broadcasting industry so are of a much higher grade. The digital switch over in broadcast also led to a redundancy of equipment, as indeed has the development of flat screens. My current work is concerned with attempting to immortalize this technology, and how it can be used and presented in the future. Like everything, all machines fail at some point, and being aware of this, I make sure that my artworks are systems, comprised of modular, replaceable parts, which together as a whole become more significant than the individual parts. Why do you usually present your moving images as physical and sculptural totems, or tribal shapes? What is the meaning of their scale (often larger than human height)? I want the video to have mass, to have a solid presence, which the screens as tiles and blocks are able to delineate. I am ambitious with scale, and make things proportional to human size, usually a little bit larger, so that they have a confrontational presentation. 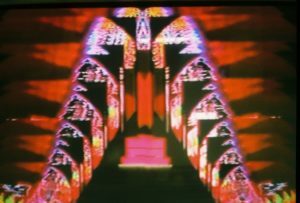 I have been translating the feedback systems which created the video content, into multi-screened based works referencing motifs of power, worship and control. 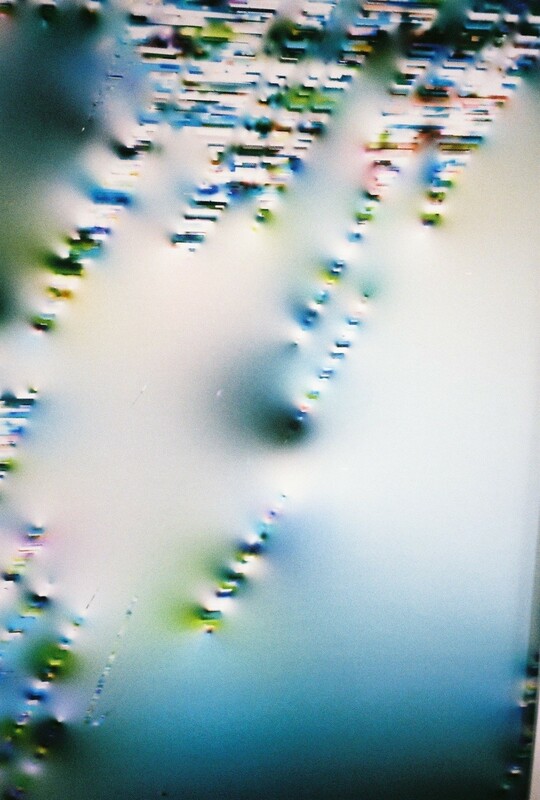 By creating tropes made of video screens, I deliberately question the instilled semiotic meanings within them. 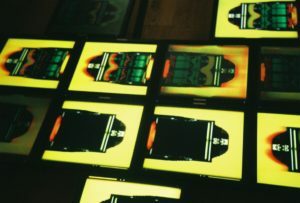 The artworks are composed in modular sections, the video monitors are referenced in my unique C-Type prints, and these have been displayed in 7m high totems, which can potentially fill an entire space. This is purposeful in order to amplify the scale of work to greater than human, as again it manipulates on a physical dominance level. We talked a lot about the ways in which we perceive images nowadays, and how we remember them, and you mentioned that your works are often unphotogenic. What is the importance of experiencing a work here and now, and why is this experience often impossible to capture? By un-photogenic, my definition was that there is not one image that can capture the whole essence of the work in one frame. 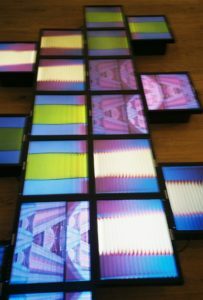 The video is constantly moving in an ouroboros loop, becoming unsynchronized to other elements, so the variations of screens are always changing. It means that to create a true experience of the work, it has to be encountered rather than portrayed in one or a series of photographic images. Since we are immersed in a visual culture with a major part formed of digital images seen via Instagram for example, we are able to “see” more than we are able to encounter. Always remember that seeing a photograph of a painting is nothing like actually seeing the painting itself. We are experiencing a soft version of artworks, flattened by an image, and often presented at a favorable angle and lighting. You refer to television as a hypnotic medium. Can you tell us a bit more of the actual technical process, the misuse of editing systems and the disruption of signal? How do you “hypnotise” us, what is the magic, the hidden process, behind your videos? From the 1930’s, the development of Television was based on a refresh rate of 50 Hz showing 25 frames per second, which is such that the human brain can perceive the video as clear flowing moving image. The technology that went into international commercial production literally resonated the optical nerve in order for us to perceive the video. Therefore, by distorting and re-engineering the raw video signal by making it unstable, the output becomes mesmeric. The vast majority of my video content is made without cameras, and instead, the forms are created within the machines themselves, therefore it is abstract by origin. It is due to my physical gestures and manipulation of the machines that bend and distort the forms, which I can then control and make into compositions. One of the things that I noticed about your studio – except the various analogue equipment- is the numerous books on symbolism. Which symbols do you keep coming back to and what is their significance for you? I decided to start collecting as many reference books on symbols, and dictionaries of symbols, in order to cross reference the meanings, and distill them down to basics. Identical ancient symbols appear synchronistically in many varied early cultures throughout the world, referencing the sun, the moon, mountains, water and fire, which signifies human connection to, and survival of life with. A basic element is the vertical totem, which I have used a lot for its minimal presentation. I likened the totems to monolithic stones and have installed arrangements of totems into groups like stone circles. I am fascinated by the cultures that placed so much importance to the erecting of such heavy stones into precise locations, potentially serving as astronomical measuring devices. It is also a very masculine symbol, and stands upright and strong, until it is toppled. A more feminine trope that is dominant in my work is the triangle, mountain/earth, and ziggurat/stepped-pyramid. It has 4 fold rotational symmetry meaning the screens can be rotated 90 degrees, giving more variations in their display. You and Martine Poppe showed at Kristin Hjellegjerde Gallery’s new space in Berlin, and the show was called “Aphrodite Lowers Her Mirror”. Can you tell us more about the meaning of the title? It refers to the Venus effect- the distortion of perception of reflection. It brings the viewer into a feedback loop, of observing and being observed. The exhibition created a dialogue concerned with the ways in which both artists wanted their work to be looked at. There were some commonalities in our studio process, which is conflated in the text for the show, and ultimately the aim was to present an immersive view, which departed from a mere presentation of flat images on the wall. Both of us focus on the creation or destruction of an image, which changes from digital to analogue mediums, and so using the reference to the effect of how society is seen, reflected back onto itself, and whether we react to what we see, seemed appropriate as a prompt. How do you engage with the great reference to mythology in your new exhibition? You told us that Aphrodite is the symbol of cycles, the evening and the morning star, the goddess: there are so many layers to her character: which one do you choose to refer to? By using ancient mythological references, we are able to look backwards in time to use archetypal constructs to compare to values in our contemporary culture. The totems acted like columns, connecting the ground and the sky, and suggesting an upward rise. The floor-based pieces were meant to make us look downwards and were animated to produce a swirling whirlpool effect, which gives the notion of a downward pull of gravity. Martine’s paintings used sky-scapes as a subject matter, which engulfed the space with airy tranquility. Aphrodite was born following the castration of Uranus (God of sky) by his son Chronos (God of (time/cycles/harvest). Chronos had been imprisoned in Earth, and had conspired with his Mother Gaia (God of Earth personified) in order to escape. What interests me is that the conception of Aphrodite was a result of the conflict between Sky and Earth, which existed as a dualism. The introduction of time to this conflict, created the personification of cycles, the day begins to follow the night, and the seasons change. Aphrodite/Venus is depicted as a beautiful Goddess holding a mirror. Other than vanity, the gaze into the mirror is showing an ability to view and realize the material world, and reflect back upon it with desires and actions, creating change. The action of raising and lowering her mirror is linked to the cycles of evaluation and systematic checking in. The new space of Kristin Hjellegjerde Gallery in Berlin is described to be meditative, oasis-like and intimate, a space in which you and Martin Poppe offer a projection for our own truth. Do you think your works require time from the viewer, are they meditative themselves? My intention is that the video works unravels a subjective truth to the viewer. It gives and one can take as much as one wants. The longer one engages with a work, the more layers of depth and subjective connection to it are rewarded. I allow much space for translation by composing abstracted forms in a lower resolution, which creates ambiguity to the deciphering of what they could be translated as. Bruce Nauman’s Clown Torture, “No,No,No,No” 1987 was the earliest and most inspirational video piece I saw, which really struck me. It is instantly engaging, humorous, dark, ridiculous and annoying, whilst hypnotic. The 2 Jester characters stomping up and down, or down and up, is so successful in its minimal presentation, capable of hooking the viewer like a fish within seconds. It is also very important what one takes away from a work, and then how the impact of the artwork sustains. Thinking back to something we have experienced can usually give us a renewed appreciation or stimulate a seemingly unconnected thought. The meditative experience comes from allowing the sequences to unfold and repeat, when the weight of the technology presenting the video becomes secondary, the looping video is emancipated, and exists outside as a phenomenon. There are certain buzzwords today such as “urgency” and “immediacy”. What do you think is urgent today? Is it time to lower our mirrors? If the definition of urgent is that which needs to be prioritized for immediate action, then I would like to start trusting my intuition more, and to not be rushed by the pressures of other authorities telling me what I should or need to do now. The physiological affect which technology has had, has made our adrenal glands hyper-accelerated, and so our attention spans have been shortened. Sending an email with more than 2 sentences is too much to be digested. Communication has been abridged, and shortened. And one would think, this is wonderful, as we are saving ourselves so much extra time, which we can apply to what? Dealing with distractions, and maintaining focus and attention are crucial to applying oneself fully. Do you have any future projects that you would like to share with us? I have been fortunate to have had many showing opportunities over the last couple of years which have created momentum in my practice to develop and resolve a series of video totems and motif’s which have been realized and presented in a wide range of environments. From traditional formal gallery spaces, to grungy warehouses, or underground caves amongst Roman architectural remains. I have also just completed a 4-month installation residency at Cannon Place in the city of London, which took on large-scale corporate space. Since Berlin, I have invested some time in expanding my studio capabilities, and have opened up access to many more machines that I have started using for some exciting new compositions and setups. I am also working out ways that I can be more mobile, and focus on production outside of the studio. I am developing a long term project involving translating the studio pieces to be installed outdoors. As television brought the unknowns of the outside world into the interior of the home, I want to reverse this by taking the video into the ‘wild’ outdoors, making it appear alien to the environmental context and to progress the dialogue that arises. The realization and installation of my works have always been spatially dependent rather than specific, so I think it is wise for me to focus on the context and duration for where and how they can be shown. This is a very challenging process, and with each new obstacle and technical issue I have encountered, I am acknowledging how I am able to respond and adapt to the progression of my ideas, and enjoying a refreshed narrative. As I mentioned earlier, I am developing how to make “immortal” versions of antiquated tech, and one such way is by creating UHD 4k portraits of installations. This instantly makes the process of the creation and installation of the sculptural work intimate and ritualistic. The added importance and dynamics of the location used to realize the works, will be intrinsically linked to the video. I have initiated this project a short while ago by searching for more desolate and uninhabited spaces, predominantly filming woodland areas. I have been documenting the found locations where I imagine my works to exist as video studies, ignoring practicalities in order to not limit their scope of possibility, which is certainly opening up new thought paths and processes.